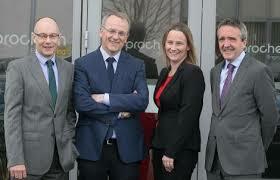 Kilkenny-based engineering consultancy Prochem Engineering is to have a new managing director, Donal Higgins, following the retirement of founding managing director Matt O’Brien. Mr. Higgins will lead the company alongside its directors Joe O’Shea and Kevin Lynch. Prochem also announced the appointment of Susan Hennessy as secretary to the company’s board. Prochem Engineering was established by Matt O’Brien in 1995 to service the process engineering needs of the southeast, Prochem’s workforce has grown from five to 70 in 2015, of which 25 are based at the company’s headquarters at Danville Business Park, Kilkenny. The firm counts Genzyme, Teva, Bausch & Lomb, MSD, Ipsen and Glanbia among its clients. Higgins said his primary objective as managing director will be to exploit Prochem’s investment in infrastructure in recent years and its development of niche engineering competencies, using specialist software such as 3D design. He aims to double the company’s annual revenue to €10m by 2020. “Matt O’Brien’s work discipline and ethics remain the cornerstone of Prochem’s culture. With the support of Prochem’s team, I wish to build on what Matt has established,” he said. Higgins joined Prochem Engineering in 1997 and was appointed as a director in 2000.